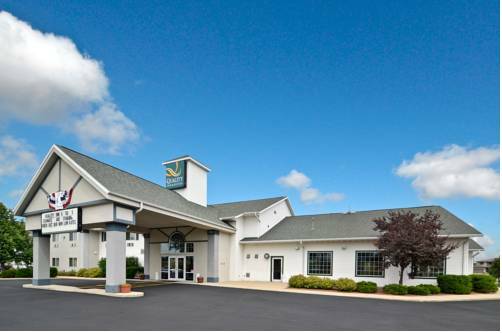 Get more for your money at the Quality Inn and Suites hotel in Stoughton, WI, south of Madison. Here, you can take care of basic business needs with our copy and fax services or host your next event in our meeting space for up to 30 people. Take advantage of additional amenities like free WiFi, free hot breakfast, indoor heated pool and guest laundry facilities, too. Your smoke-free guestroom features a flat screen TV, hair dryer, coffee maker, iron, ironing board, microwave and refrigerator. Also, earn rewards including free nights and gift cards with our Choice Privileges Rewards program. A "Cowlossus of Roads" - larger-than-life fiberglass rendering of a rural milk machine. Local landmark restored to prominence among stores and development along the highway. Life sized, wears giant eyeglasses. The adjacent gas station sells a variety of Pinkie souvenirs. Dedicated in 1911 as "The Eternal Indian," but the locals call it Chief Black Hawk. At 48 feet high, it's the second-tallest monolithic concrete statue in the world. It cracked in the brutal Winter of 2014 and is currently wrapped like a mummy in black plastic.